A clean, properly functioning digestive tract is paramount to our well-being. For internal cleansing and daily detoxing you ingest clay. Doing so on a daily basis will help clean your intestines and keep them that way. * Liquefied Calcium Bentonite may be purchased or made from clay powder. Mix a rounded teaspoon of clay powder in 2 ounces of water. Combine in a glass or food grade plastic bottle with a plastic or non-metal lid; shake vigorously until all lumps are gone. Allow the mixture to stand 5 minutes with lid slightly loosened to vent and allow for expansion, re-tighten the lid, and shake again. 1 cup (C) = 8 oz. The skin is the largest organ of our body and can be considered the outward reflection of what’s happening inside. Used topically, Calcium Bentonite Clay pulls out excess oils and impurities and stimulates circulation and cellular revitalization. * Whichever method you select, your skin will thank you for it! Because the body detoxifies through the skin, clay baths are becoming more and more popular for drawing out toxins and cleansing the skin. To make mixing easy, start by mixing 1-2 cups (8-16 oz.) of clay powder with 5 cups of water in a lidded container or in a blender, then add to bath. An alternative method is to lightly sprinkle 1-2 cups (8-16 oz.) of clay powder into the water as it is running, mix until fully dissolved. A whisk may be used to assist in mixing. Take care, if a blender or metal whisk is used, to immediately wash any clay residue off of the metal blades or wire hoops after mixing the bath. Soak for 15-20 minutes. Submerge as much of your body as possible during the bath and stir the water to circulate the clay. The more clay that is used in the therapy, the more powerful the response. Drink water during and after the bath to avoid dehydration. If the clay is dissolved adequately, it is safe for drains and septic tanks. Cleansing Clay Mask draws out skin’s impurities and excess oils, leaving it refreshed and purified. 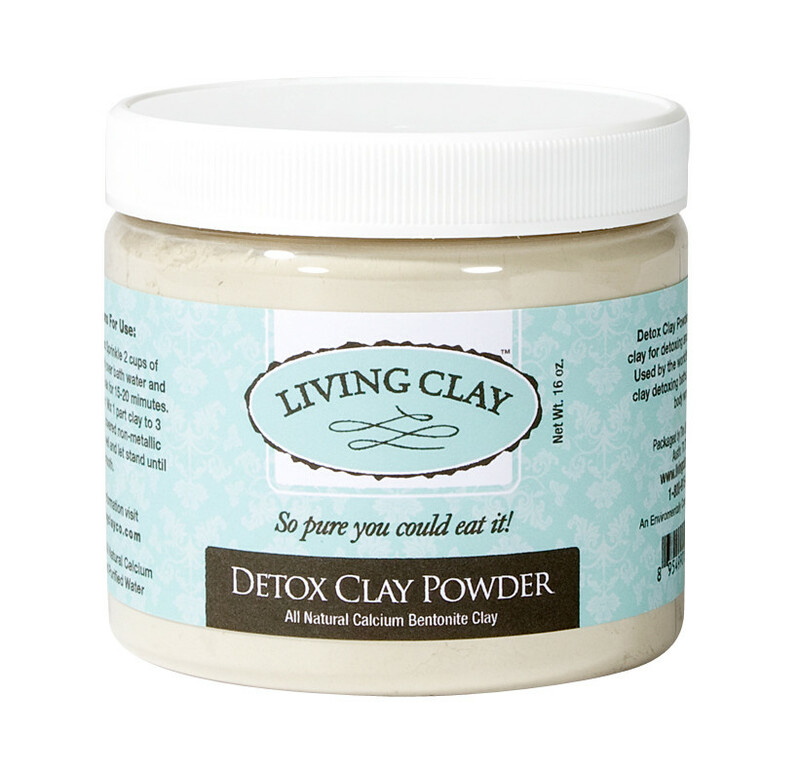 Bentonite clay for topical application may be purchased pre-mixed or made from Detox Clay Powder. Cover and shake vigorously for about a minute or until all lumps are gone. Larger batches may also be prepared using an electric mixer or blender; however, take care to immediately wash any clay residue off of the beaters. Allow the mixture to stand for 15 minutes with lid slightly loosened to vent and allow for expansion. A clay poultice is simply a thicker application of clay mask, intended to be held against the skin for prolonged periods of time for the purpose of concentrating the clay’s action on the affected area. Use the topical clay mask mixture. Apply a ¼ to ¾ inch thick layer of clay mask over the desired area and cover with plastic wrap or an elastic bandage to keep the wet clay in place. The timing and repetition of any application will vary from 30 minutes to an hour to all day, according to need. More specifics can be found in the book, Living Clay, Nature’s Own Miracle Cure. Store away from extreme heat and direct sunlight. Liquid clay should be stored in a food grade plastic or glass bottle with a non-metallic lid and does not require refrigeration. Always use a clean utensil when scooping the clay out of the container. Never leave the clay in direct contact with metals for long periods of time. For example don't leave the clay in a metal bowl. The clay's electromagnetic charge will act on the metal severely limiting the clay’s ability to draw when applied to the skin and may cause the metal to prematurely rust. Keep out of close proximity to chemicals and strong odors.